It is under the reign of Louis XV, more precisely, under the regency of Philippe d'Orleans, nephew of Louis XIV that the daughter of the Count of Brécey left to one of his uncles in Paris. Soon she met a man 11 years older whom she married in 1720. 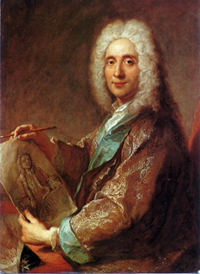 His name was Jean Julienne and enjoyed an enviable position and highly visible in Paris because he had succeeded his father as Director of the "Manufacture des Gobelins". Himself was an amateur painter and found art in his spare time, he encountered all painters of the Court and was a friend and protector of Antoine Watteau, who at his death left him a great deal of his works. 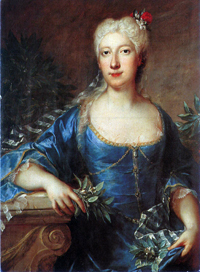 Since then Marie-Louise de Brécey de la Sémondière lived with that man whose reputation was such that the King ennobled him in 1736 and making him the Knight of the Order of St. Louis. Jean de Julienne and his wife bought a broad mansion in the countryside in the village of Passy. Today, remains only the former outbuilding in which Honoré de Balzac lived between 1840 and 1845. There he wrote "le Cousin Pons et la Cousine Bette"; the house of Jean de Julienne is now owned by the city of Paris and the museum Honoré de Balzac. But their everyday life took place in their beautiful hotel located number 3 of the "Rue des Gobelins" beside the Manufacture which was flourishing. Jean de Julienne worked his whole life to maintain the memory of Antoine Watteau and etched all his work which is the benchmark for this painter. In memory of its important functions, a street of the 12th district bears his name. His life and passion for art and precious objects that make him being regarded as the largest french collectors of all time. On his death in 1766, his wife did not wanted to retain the firm aesthete composed of the finest tables are now visible in the biggest museums in the world. During the visit of the castle Sémondière you will find many documents and sets retracing the life of this couple very "Parisian" but retained links with their brother and brother-in-law who continued to manage the field Normandy.